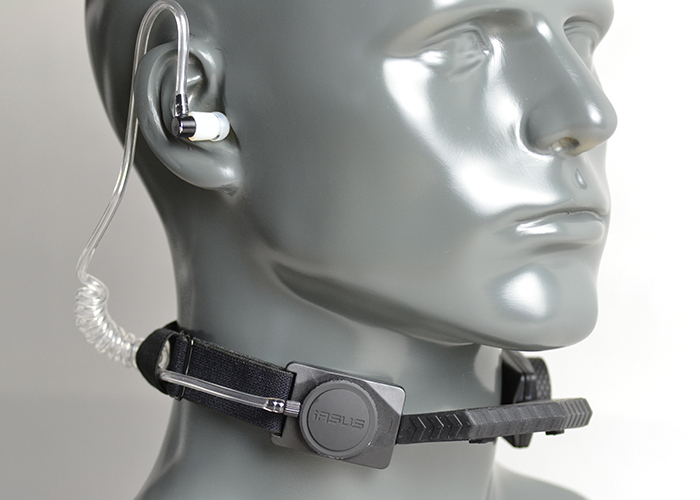 The STEALTH basic unit is the core of the iASUS wireless throat mic system. An innovative design utilizing an innovative dual structure of poly carbonate and silicone which allows for both high flexibility and ridge strength in design. This new design is both IP68 waterproof and also built to MIL STD 810 as well. A basic 3 button design allows for all standard blue tooth functions such as power, pairing, vol +/-, and music track selection. The 3.5mm audio output module for the STEALTH allows for customization of preference for earpiece. From single earpiece to stereo noise isolation earbuds, helmet speakers, even your own custom earphones that have a standard audio 3.5mm audio jack will be compatible as well.